It’s New York Fashion Week and Pantone has just released their Fall color report for 2011. In December the color of the year was announced; Honeysuckle is no longer alone. The complimentary palette brings to mind vintage sepia tones. We can expect to see these colors influence fashion in the coming year. I’m pleased to see some of my favorite shades in the mix. I recently picked up a pair of shorts in Cedar. Deep Teal is a staple in my wardrobe. I’m a huge fan of the combination of the first three warmer colors, they’re reminiscent of the shades found in a sunset. I once painted a bedroom ceiling in Orchid Hush and cannot wait to see this in the stores. How about you? Which are you drawn to? Yummy colors! Lots of gemtomes which work great with my coloring! So glad I keep a closet archive! Have to add stock on that coffee liquer though! Emberglow is my favorite now that I'm on this orange kick – I think it's beautiful. I also really like bamboo and deep teal. Possibly even together. I like the fact that they all go well together. I remember reading before honeysuckle that TEAL was going to be huge. I think it will be bigger than pink. Colors I like? Red, white and blue, all jumbled together. Yeah, clearly my cravings do not heed the melody of the Pantone. I love these colours coming through at the moment. Some of my favourites are here. Honeysuckle and the coffee colours are great. Hopefully I'll have some shots next week of New York. Got some great shots today of some of our favourite bloggers. 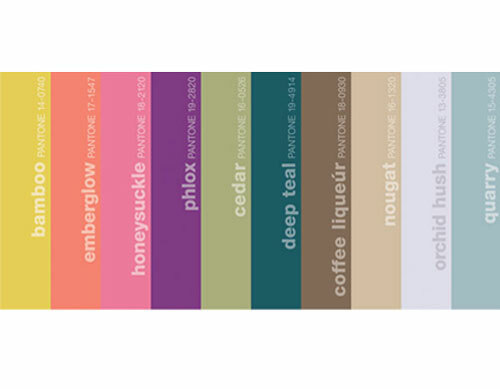 I love these colours, particularly the quarry, teal, cedar and phlox. Looks like it could be a great season. Deep Teal, yes! I’d love to see more of that around in upcoming months. That color family always works well for me. The others in this Pantone array don’t do much for my coloring; I’d like to see the jewel-like purple a little cooler in tone and the brown richer, deeper. Ah, well. Some clothing merchants listen to Pantone; plenty of others don’t. My dear friend, I think that by now, you know I am in love with all colours, ahhhhhhhhhhhh. The four ones , left to right are my favourite. Love the names they are given. I am going to copy them to remember. they do sound posh heheheh. the blog loads extremely quick for me on Firefox. Exceptional Blog! factory, sacrifice, pastor, counsellor, psychic science, philosophy. here frequently. I am fairly sure I’ll learn many new stuff right here! scratching the game discs to the point they no longer function and also not to forget the rate kids tend to lose things. the performance. N5 supports clean ROMs, Homebrews and Multimedia files with no slow-downs or hang-ups. We went to the internet and searched for Roofing Salt Lake City. Without it, you’ll just have furniture and a bunch of walls. Other than rain, powerful winds are also fairly typical in the early spring. right here regularly. I’m reasonably certain I’ll learn many new stuff right right here! I will instantly take a person’s feed once i can’t find the contact registration link or even e-newsletter program ηλεκτρονικό τσιγάρο. Have you got every? Nicely allow for everyone fully grasp to ensure I really could subscribe. Thank you. thing. Below is a list of ideas and suggestions that will help ALL students to succeed in the SMET classroom. their own homes and communities. The business can continue operation without any losses.